1. SHUT OFF ENGINE. 2. REMOVE CAR KEYS. 3. TAKE OFF SEATBELT - ProudMummy.com the Web's Community for Mums. 1. SHUT OFF ENGINE. 2. REMOVE CAR KEYS. 3. TAKE OFF SEATBELTS. 4. LOCK CAR. 5. CARRY KEYS WITH YOU. 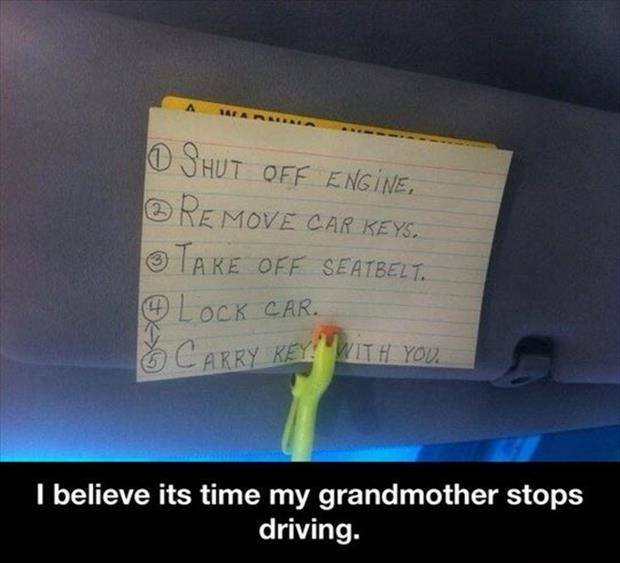 I BELIEVE ITS TIME MY GRANDMOTHER STOPS DRIVING.